It’s that time again, we have a new feature! TalkJS is an integrated and a real time messaging service for online marketplaces, web apps or social platforms. We built a messaging service for private one-on-one chats, when we started getting requests from our customers to be able to add more people to a conversation. 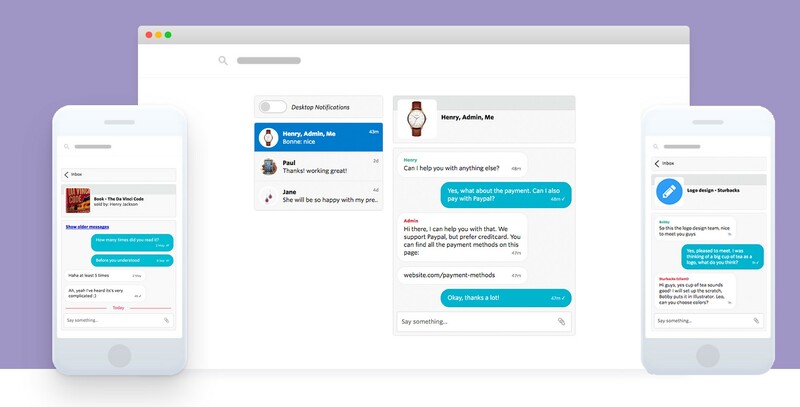 We listened to our customers and are happy to announce we are launching a new feature called Group Messaging! As of today TalkJS allows you, online marketplaces, to add more than two users into one single conversation. This also means that you can now be a part of the conversation. Group messaging lets your users send messages, pictures, videos, and files to other participants. Your users can keep track of their messages and whenever they leave the platform your users will always know what’s going on through our SMS or email fall-back. One popular use case is when employees of an online marketplace, which allows users to talk to each other, wish to be part of the conversation. To be a form of an intermediary or have an active presence in the chat. So imagine, if you will, there is an online marketplace that hosts suppliers for events, which supply tables, lights, catering, and so on. Now through this online marketplace the supplier of tables or catering and the customer can discuss the details of the event. Additionally, if the buyer has questions about payment, shipping or delivery, which the online marketplace sometimes handles, it might be necessary for a representative of the online marketplace to be present in this conversation. Can you picture it? The buyer, the seller, and the marketplace are all present in this group message, which allows everything to be arranged at once — in one conversation. We are sure there are many different ways to use Group Messaging that we haven’t thought of yet. We can’t wait to see what you come up with! Reach out to us here or dive right into the developer documentation!